Activists say there's a better way to address homeless encampments. 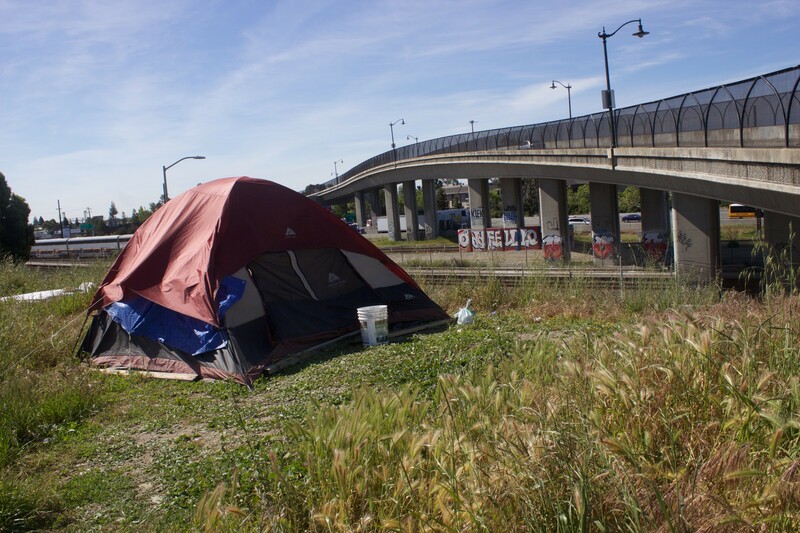 A tent on a plot of land east of downtown Oakland near 16th Avenue this past April. They came in the morning: Police officers rousting people from sleeping bags and tents, and ordering them into the chilly air. It was early February, and the Oakland cops and public-works crews were at yet another homeless encampment, this one at Grove Shafter Park. The location was known to residents at the “Promise Land” — a place where the weary and destitute sought security and support. A small group of activists also helped clean the park up, and were even building tiny, makeshift cabins from scrap materials. But all this prompted some nearby residents — the sorts with houses — to become frustrated by the camp’s sudden growth. In fact, officials would report that there had been eighteen health and safety code violations at the camp. So, on February 3, the city deemed it time for the Promise Land to go. But the raid wouldn’t solve the problem; dozens of displaced people remained without homes. They would only move somewhere else to pitch their tents, likely another park, or a strip of city-owned land near a highway. The sweep that removed them was emblematic of the city’s approach to its growing homelessness crisis, like a game of whack-a-mole, pushing campers from one spot to the next. “Their approach is preposterous,” argued Vincent Pannizzo, the founder and director of Mission for the Homeless, and a homeless Oakland resident himself. The Grove Shafter displacement was just one of hundreds of homeless camp “abatements” led by the City of Oakland over the past 14 months, according to documents reviewed by the Express. Public records obtained by this paper reveal that Oakland spent at least $210,638 in 2016 and the first weeks of 2017 on cleaning around, or dismantling, homeless encampments. There were 279 separate “clean ups” in 2016, and another 33 between January 1 and February 14 of 2017. The city’s data shows that 1,475 yards of trash — but possibly also tents, clothing, and other possessions — were thrown away during this period. Camps located in Lakeside Park, 85th Avenue in deep East Oakland, Lafayette Square and along Brush Street in West Oakland, and Grove Shafter Park in North Oakland were among the most frequently visited by public-works crews and law enforcement. But the data shows that the city’s homeless camps are concentrated in the flatlands of West Oakland, around Lake Merritt, the Fruitvale, and deep East. Half of the sweeps conducted by the city were carried out in District Three, encompassing downtown and West Oakland. On the other end of the spectrum, District Four, which includes Montclair and much of the Oakland hills, saw only three homeless-camp abatements since 2016. City workers conducting these sweeps say they don’t want to make the lives of homeless campers more difficult. In recent months, they’ve pushed back against Oakland officials, and asked for better policies and more support, so that they can provide trash services to the camps and clean up the illegal dumping that occurs frequently around them, all without displacing people. Pannizzo himself came west for graduate school at UC Berkeley. He eventually changed career paths, though, and has been assisting the homeless for eighteen years through his nonprofit, and with the impromptu sermons he delivers as a well-known street preacher. Oakland and Alameda County’s homeless population far outnumbers the beds available in shelters, and those left to sleep on the sidewalk must worry constantly about harassment not only from random people, but also from law-enforcement officials, they say. For a brief period earlier this year, the City of Oakland designated an encampment at 35th and Magnolia streets in West Oakland as a legal outdoor shelter. With $190,000 allocated specifically for this purpose in July by the city council, the camp’s 40-odd residents were provided portable toilets, hand-washing stations, showers, and even medical services. Dejon Goolsby lived at the encampment. The 32-year-old was driving a UPS truck until 2011, when he says he was fired. He has been homeless almost ever since. He resided at the 35th and Magnolia camp for about six months. Goolsby said the camp was safe and clean, and more of a community than an encampment, thanks largely to the help of police, other city departments, and volunteers. Pannizzo believes the encampment at 35th and Magnolia could be replicated at sites throughout Oakland. “There are vacant lots all over Oakland,” he noted. But in May, a fire tore through part of the camp. Then the city ordered all of the residents to leave, shutting it down as was planned from the start. Some social workers think that efforts such as Oakland’s 35th and Magnolia “Compassionate Communities” encampment are counter-productive, though. Elaine de Coligny is the executive director of EveryOne Home, a Hayward-based organization striving to end homelessness in Alameda County. De Coligny said supporting encampments with infrastructure like portable toilets and showers might lessen incentive among homeless residents to find permanent housing. “So, the question for communities with limited resources is, ‘How much do we spend improving the camps, managing the crisis as though it will be with us always, versus investing in affordable housing so we can eliminate homelessness?’” she asked. But Goolsby said the support offered to residents of his encampment is not a waste of time. “We appreciate the help, but we aren’t just staying here to live on handouts,” he said. Rather, Goolsby explained, the encampment offers a safe and secure place where residents may regain their feet, look for a job, and eventually move back indoors. In fact, 23 of the original 41 residents who were present at Goolsby’s camp as of October have been transferred to either a shelter or transitional housing since city workers began visiting the site late last year, according to Harry Hamilton, a public information officer with the City of Oakland. Meanwhile, says Hamilton, the same support measures provided at 35th and Magnolia are now being considered for a number of other encampments around the city, though he says affordable housing is ultimately the answer for people living on the streets. But empathy seems to have been tossed to the wind in some of the recent encampment shutdowns. The Grove Shafter camp, for instance, was dismantled in the rainiest months of the rainiest winter the Bay Area has seen in years. City funding and a well-intentioned pilot project may not yet have brought Goolsby indoors.